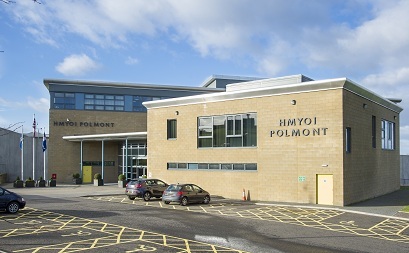 Polmont is Scotland's national holding facility for male young offenders aged between 16 - 21 years of age. Sentences range from 6 months to Life. The average sentence length is between 2 - 4 years. Polmont first opened as a Borstal in 1911. Blairlodge Academy opened in 1843 by Robert Cunningham, a Church of Scotland minister, who also played a significant part in the Free Church breakaway in Polmont in the same year. The new school was for boy boarders and flourished under an innovative and dynamic headmaster J Cooke-Gray who took over in 1874. At the turn of the century Blairlodge was the largest school of its kind in Scotland and was the first to use electric lighting - it had nearly nine hundred bulbs at the same time as the people of Falkirk were being shown electric light as a novelty. The pupils who left Blairlodge entered the privileged world of the Colonial Service, Oxford or Cambridge or into the upper echelons of the commercial world. After the death of Cooke-Gray in 1902 the school experienced financial difficulties and when it was forced to close in 1908 by an outbreak of an infectious disease, it never reopened. The buildings were purchased by the Prison Commissioners in 1911 and shortly afterwards opened as Scotland's first Borstal. It is now, of course, Polmont Young Offenders Institution. M80, A80, M876 to M9 East to Junction 4 or M8 to Junction 4 M9 Junction 4 Linlithgow/Bathgate, follow signs to Polmont for approx 3 miles. M8 Junction 4 Bathgate,follow signs for Falkirk approx 10 miles. The prison is in Brightons near Polmont follow the strategic traffic signs along the way. From Edinburgh Waverley; the train is running 03, 15, 33 and 45 minutes past each hour on Monday to Saturday and at 00, 06 and 35 minutes past each hour on Sundays. From Glasgow Queen Street; the train is running at 15 and 45 minutes past the hour on Monday to Saturday and at 30 minutes past each hour on Sundays. From Stirling; the train will be running 07 and 37 minutes past each hour on Monday to Saturday and at 10 and 47 minutes past each hour on Sunday. There is a good 15 minute walk from the railway station but taxis are available at the station, telephone ( 01324) 623 999. There is a shorter route to walk via the canal path, accessible from the canal bridge a short distance along from the railway bridge. There are regular bus services from Glasgow and Edinburgh to Falkirk. From Falkirk the Maddiston bus service reaches the establishment. Young persons and woman currently on remand are entitled to daily visits Monday to Friday and one visit at the weekend either Saturday or Sunday. Young persons and women require their visitors to book 24 hours in advance (visit places are subject to availability) on a dedicated telephone hotline 01324 722299. This line is open from 08.30-11.30 and 13.30-16.00 Monday to Friday. All convicted women and young persons book the visits and will then contact their visitors and advise of the time and date of the visit. Professional persons (solicitors, advocates, agents, social workers etc) wishing to visit Polmont to see clients should book an appointment to see young persons or women or a video conference by phoning 01324 722350 Monday – Friday from 0830 - 1130 or 1330 - 1600. Below is a list of identification requirements, the times of visits session, depending on the location of the young offender, facilities and what you can expect coming to the prison. For anyone over the age of 16 years to gain access to the prison for the purpose of visiting, you must have two forms of identification, one of which must be photographic ID. Under 16 years old require ID, such as a birth certificate. Entry to the establishment will not be permitted without acceptable identification. Upon entering the main door of the prison, there is a front desk staffed by prison officers. You will be required to present your identification to the staff. The family hub and family contact officers are also located in this area. Everyone attending the prison for a visit should book in at least 30 minutes prior to the start of the session at the front desk. This is to allow sufficient time to allow the staff to process your details and to accept any property or money you may be handing in. You will require a £1 coin to operate the lockers into which you can securely store any items which you are not permitted to take up to the visit room with you. Toilet facilities are available in the visitors waiting area. All visitors will be asked to walk through a metal detector and given a rub down search by a member of staff prior to going upstairs to the visit room. At times, there may be the SPS Dog Unit operating at the visits – it’s nothing to worry about and you will be given instructions by the staff. If you have any concerns at all – please talk to a member of staff. In the visit room there are vending machines and a well-stocked WRVS canteen along with a play area for children, which is unsupervised, and parents or guardians are responsible for children at all times. The visit room has recently been renovated, creating a warm and welcoming atmosphere, to enhance the time the visitors and young offender have together. If you have any questions or concerns whilst visiting Polmont you can direct these to any member of staff. Money should be handed to the front desk and an officer who will issue you with a receipt. Money and property can be handed Monday to Friday 8:00–20:00 and Saturday and Sunday 9:00-17:00. A maximum of £50 cash may be handed in per visit. The young offender will send a proforma listing the approved items. The proforma and property must be handed to the front desk on your arrival. For the visit please note that only the items listed on the proforma can be accepted. You can bring less than listed on the proforma however you will not be permitted to bring additional items. Young offenders may receive money in the items of mail, although the posting of cash in this way presents a greater risk for the sender, as any loss prior to the item reaching the prisoner's accommodation would have to be borne by the sender. Use of recorded or registered letters will help reduce that risk. If you have any complaints or queries that cannot be answered by the phoning of the above telephone number you may either call the visit manager on 01324 722226 or by writing to the Governor. be used to book visits within normal working hours.